The last few weeks have been crazy. I’ve been working! It is only temporary, but I’ve been loving the library I’ve been working for. I heartily wish they had a position for me. I’ve missed Em tremendously the last few weeks, but being competent at a job has been a real ego boost for me. As much as being a stay-at-home mom/student has been enjoyable, it always seems to call into question my sanity and judgment. They joys of toddlers. I am so far behind with what I have been up to that I won’t be able to catch up in just one post. Would you like to start with some spinning? I spent the Fourth of July weekend plying. Surprisingly, it actually occurred to me to take notes while spinning so I’d have something blog about. So, the amazing thing is that I plied yarn that’s been on the bobbin for nearly two years. Can you believe it? I could nearly faint from the shock of it, myself. You may remember when I blogged about it in May, though I didn’t even post a new picture, just recycled the original one. From back in October of 2006. This begs the question of why. Why has this fiber, lovely as it is, been on bobbins for so freakin’ long? I don’t know if I have an answer for this. It is easy to spin, is grabby enough that I could (and did) spin it quite fine. The colors are lovely and change at an interesting pace, therefore it isn’t boring. For some reason spinning it felt like a life’s work. As I was plying I felt like it was taking forever. Really, this couldn’t have been more than 4oz, but I suppose the fineness and the long color repeats explains the angst. However, the fiber itself was pleasurable enough. Does that make sense? 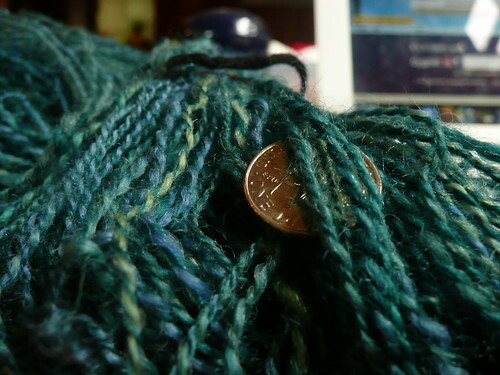 One of my goals (and problems) while spinning this over such a long period was spinning a balanced yarn. I didn’t want it over plied only to be relaxed in finishing. Yet, this was the fiber I had trouble spinning about 18 months ago, because it was falling apart. I was lucky to be at a spin-in in February of ’07 and have a bevy of experienced spinners at hand to help with wheel tuning and spinning advice. Turns out I was not adding enough twist and the fibers were not holding together. Although that was a great revelation, I had to be very careful not to have too great a change in the rest of the single on the bobbin. I am not sure how or why that it would be a bad thing, I just figured things would not turn out right. When dried with blocking, the yarn is temporarily ‘set’, like putting your wet hair on rollers to make a temporary curl. As soon as the yarn is exposed to water again–even in the form of a very humid day, just like with human hair–the original twist, or lack of, will reassert itself, even if it’s been woven or knit in the meantime. Sounds like bad news, right? I had a ridiculous time getting the wheel set up to ply. I emailed/plurked/IMed Jess, my personal guide to spinning, but I was still obviously doing something wrong, until I somehow got it settled. I could have preserved the color changes with a chain ply, but really wanted a marled look. Scratch that, wanted a look totally my own. 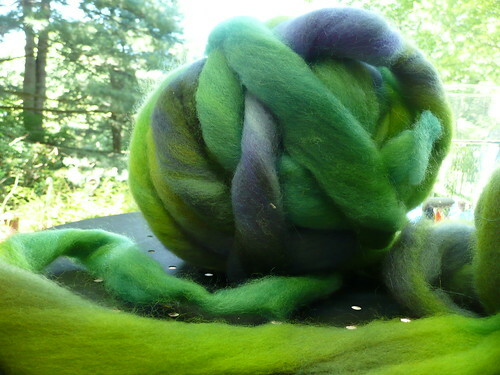 In spinning I’ve done since then I’ve done some playing around with making color repeats longer or shorter than the roving was dyed. This stuff, though, was started at a time when I was exceptionally new at spinning, and finished at a time I had much more confidence. I finally figured out my yarn has a right to be exactly what I make it to be. I freaked out because I had no fiber handy to spin. I dug through some as-yet-unpacked-boxes and found some lovely fiber gifted to me nearly two years ago by The Gabby Knitter. My photography skills do not do it justice. Finally, with school behind me and a roomy home, I’m ready to do what I’ve wanted to for ages: Have a spin-in at my barn house. I’m working up a flier at the moment, so let me know if you want me to email it to you. I’ll have it in a post in the next few days, too.